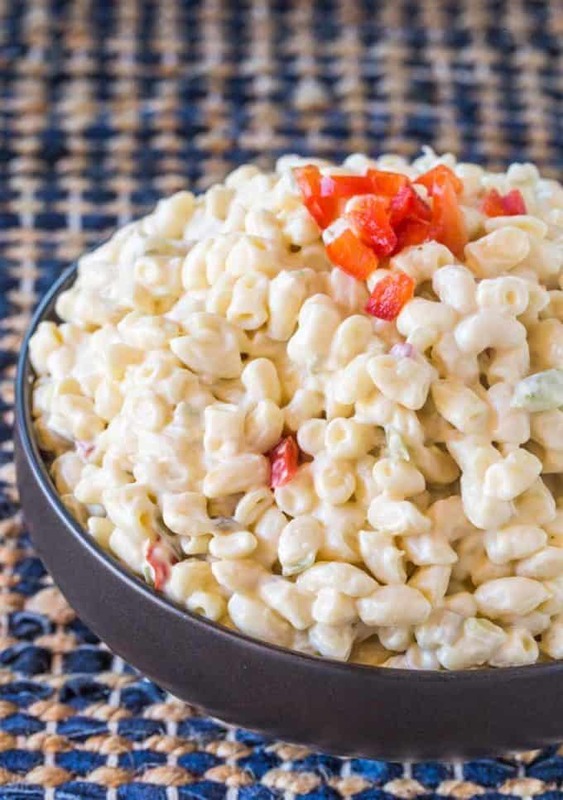 Hawaiian Macaroni Salad is the perfect side dish to your favorite summer grilled foods or teriyaki recipes. 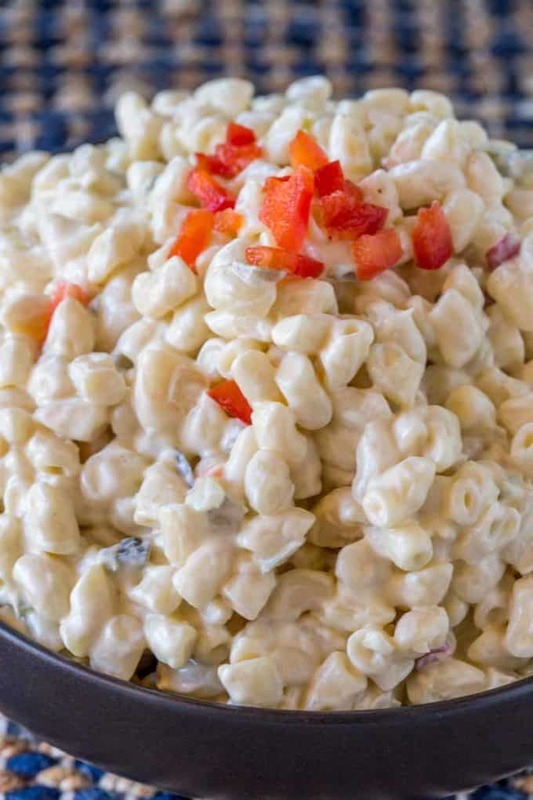 This Hawaiian-style Macaroni salad is different than traditional macaroni salad thanks to extra mayonnaise, shredded carrot, and shredded onions. Hawaiian Macaroni Salad is one of my favorite things about getting Hawaiian food. When you order a Hawaiian lunch plate either in Hawaii or here in the mainland, you choose your grilled, fried, or teriyaki glazed meats, and you get a serving of rice on the side and a scoop of amazing macaroni salad. 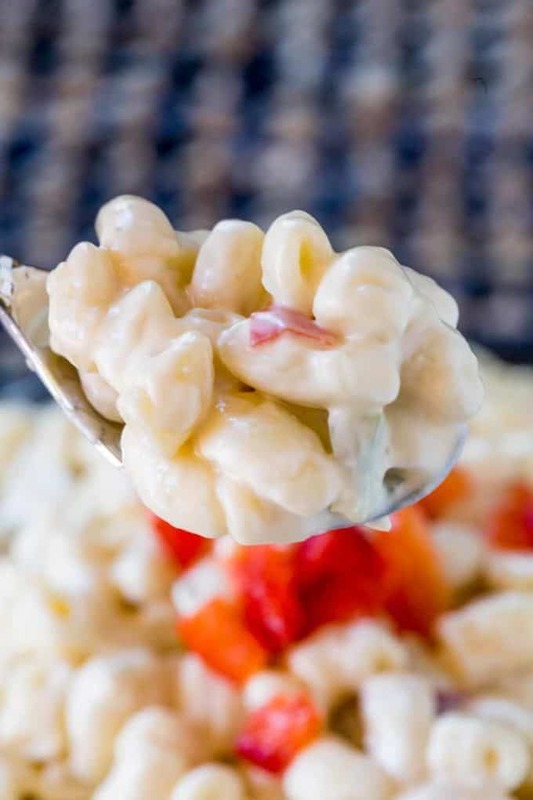 So how do you make Hawaiian macaroni salad exactly? Or how is it different than regular macaroni salad? The difference between most macaroni salad and Hawaiian macaroni salad is the extra mayonnaise, the shredded carrot, and the shredded onions. Want to add some different flavors to your Hawaiian Pasta Salad? Many locals will add tuna to this salad. This is totally authentic to Hawaii, but not the classic lunch plate side dish I am recreating. 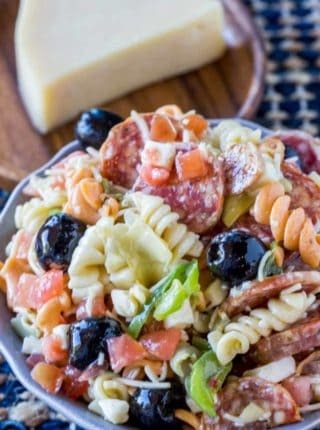 Make sure not to leave out the grated onion, it really does add an authentic flavor to this Hawaiin pasta salad. I add red bell pepper for color and crunch, you can certainly leave this out. Some people like celery for crunch, try what works for you. Some Hawaiians like to do half potatoes and half macaroni too, it’s an easy way to make a salad that people who love potato salad would love too. Mayonnaise: This is the classic mayonnaise used in authentic recipes if you can source it go for this brand! Apple Cider Vinegar: This brand is the most even and mellow flavored and perfect for the macaroni salad. Grater: Grating onion can be tricky, this grater is the safest I’ve found yet that isn’t my mandoline. The thing I love about it is the guard. I HATED grating things before. Kosher Salt: I think there is often confusion when I list Kosher salt in the ingredients. I get emails saying food came out salty. Kosher salt is different than table salt, with a bigger granule and less salty flavor. 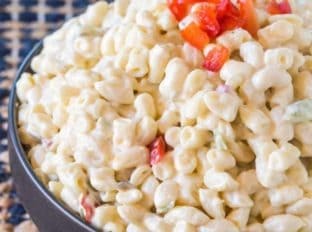 Hawaiian Macaroni Salad is the perfect side dish to your favorite summer grilled foods or teriyaki recipes. Add the apple cider vinegar to the pasta while still hot and toss. Let chill in the refrigerator for as long as possible (at least two hours, but preferably overnight). Oooh, that sounds amazing! I’m not sure how else to add it but you could probably cut up chunks and mix it in. Good luck! Oh my gosh, way way way too much onion. I tried it, followed everything to a T, and it just tastes like onion. So so disappointed. About how much dry pasta equals a pound of cooked pasta? Use 1 pound of dry pasta for this recipe. I just wanted it to be clear that it needs to be cooked according to the package directions before adding all the other ingredients. Sorry if that was confusing. 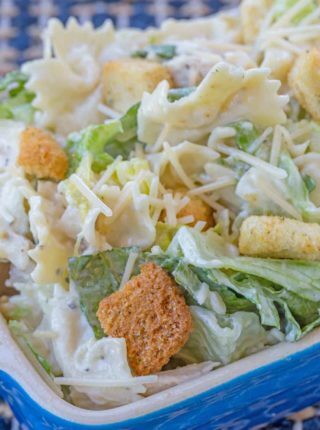 Thank GOODNESS pasta salad season is back! This twist on the original looks absolutely delish- such a fun way to switch things up! 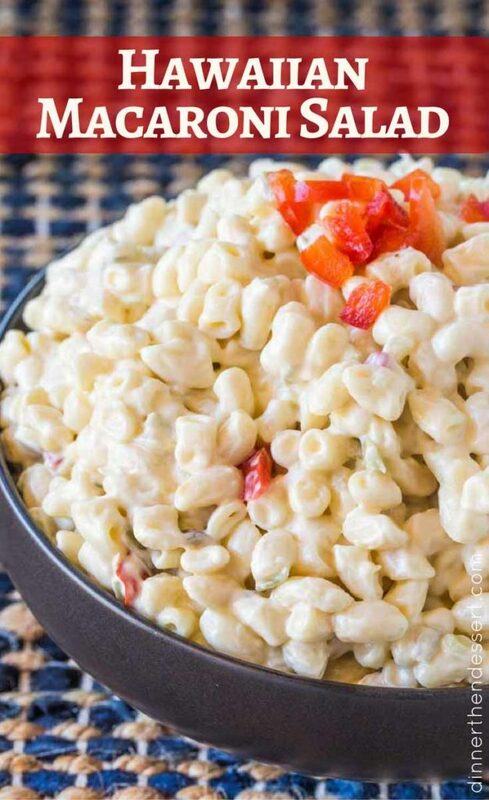 I love macaroni salads, this one looks delicious! I love the combos of this salad! 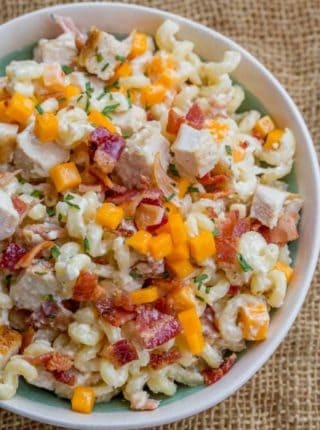 This would be a great way to mix it up from the traditional macaroni salad at our summer BBQs…definitely want to try it! Definitely Michelle! Hope you enjoy it! 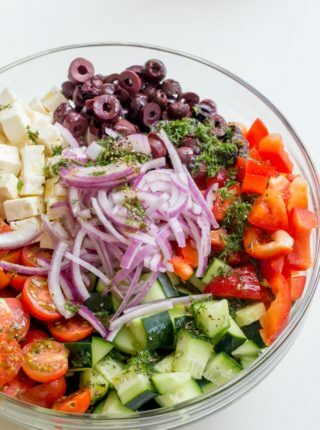 I need to try this salad! Seems to be so easy and so delicious! It really is, Catalina! Enjoy! !